James O'Keefe, pictured in 2015, says he plans to release secretly recorded material from inside CNN. 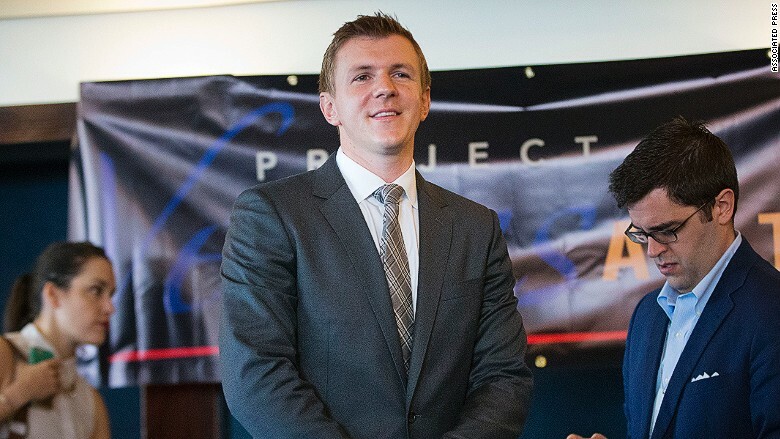 Conservative provocateur James O'Keefe is setting his sights on CNN. O'Keefe said in a telephone interview with CNN on Wednesday that he has "a few hundred hours" of "secretly recorded material" from inside the network. "We're calling it CNN Leaks," he said, drawing inspiration from WikiLeaks' document dumps. He said "part one" would be published Thursday at about 10 a.m. ET. "This is all legally recorded information," he said, declining to be more specific. O'Keefe, who uses undercover stings to trap his targets, has a reputation for shady tactics and exaggerated statements. Some of his so-called exposés have relied on misleading editing techniques. And an incident in 2010 landed him in legal trouble. After he was arrested at Senator Mary Landrieu's office, O'Keefe pleaded guilty to a misdemeanor for entering federal property under false pretenses. He was sentenced to three years of probation, plus community service and a fine. Given his track record, many consider O'Keefe discredited, and not a serious journalist. In the phone interview on Wednesday, he said that characterization is "very false and very inappropriate." O'Keefe's fans, who cheer him on via social media and donate to his nonprofit group, Project Veritas, say he is serious about rooting out liberal corruption, voter fraud and media bias. Armed with donations, hidden cameras and his YouTube account, O'Keefe has repeatedly tried to embarrass big news organizations in the past. Most of his other subjects have been liberal groups. Asked why CNN is one of his targets, he said, "My audience, the American people, are deeply upset at the media." He cited President Trump's critiques of "fake news." "We think our media needs to be held to account, and CNN is kind of the leader of that. CNN has a very important role as an arbiter of news," he said. Beyond just CNN, "the media is a huge target of mine right now," O'Keefe said. "We have a dozen investigations going on, which is one of the reasons I don't have time to go through hundreds of hours of tape," he added. So the "raw information" will be posted, calling to mind WikiLeaks' dumps of stolen emails from Clinton campaign chairman John Podesta last fall. Along with Thursday's release, O'Keefe said he would announce a "financial award" to encourage other sources to come forward. O'Keefe is best known for a 2009 takedown of a prominent community organizing group called ACORN. In a series of stings, O'Keefe presented himself as a pimp and sought advice from ACORN staffers about operating a brothel and evading taxes. The scandalous caught-on-camera conversations led to firings and federal defunding of the group. Some ACORN supporters raised questions about the ethics and the legality of the stings, however, and one employee sued O'Keefe, alleging that O'Keefe broke the law by taping him without consent. O'Keefe settled for $100,000. Later targets included NPR and Planned Parenthood. Sometimes his stunts backfired. In 2010, O'Keefe tried to "punk" Abbie Boudreau, then a CNN correspondent, with hidden cameras aboard a boat, but the plan was thwarted. At the time, O'Keefe's mentor, the late Andrew Breitbart, said the plan was "patently gross and offensive." O'Keefe has a tendency to exaggerate his findings, with video titles like "Rigging the Election." A profile in The New Yorker last year called him an "amateurish" spy. O'Keefe told the reporter, Jane Mayer, that "he is not a dirty trickster but an investigative journalist and a leading practitioner of modern political warfare." Last fall, O'Keefe released tapes of Democratic operatives with ties to Hillary Clinton's campaign talking about inciting violence at Trump rallies. One man, Scott Foval, was dismissed, and another, Robert Creamer, resigned from his campaign-related responsibilities. The Democratic National Committee said the recorded conversations were only hypothetical, but the embarrassing video clips received widespread attention, including from Trump, who brought up the tapes during one of the presidential debates. PolitiFact noted that O'Keefe's investigators often goad their subjects "with leading statements," and "the videos are edited in ways that the context of the conversation or the meaning of the statement isn't always clear." But the fact-checking site also noted that what Project Veritas found was "eyebrow-raising." O'Keefe said Thursday that "the media was dragged kicking and screaming to cover that story." In recent interviews and speeches, O'Keefe foreshadowed his desire to target newsrooms, even though he also said in one speech that "social media is now more powerful than the mainstream media." In a presentation last November, he said "the media in this country" is "dead, and we have killed it." Last month O'Keefe said at a party for Trump supporters that he had spies "embedded in your institutions." "We are inside the newsrooms, and that is going to be our next target," he said. O'Keefe previewed the CNN investigation, without naming CNN, on Sean Hannity's radio show on Tuesday. Hannity sounded gleeful about it. But others have a much more skeptical view of O'Keefe. Hannity also hosts a prime time show on Fox News, and some of his colleagues have openly questioned O'Keefe's credibility. "He's had to pay lawsuit settlements," Fox host Juan Williams said last fall, saying O'Keefe "doesn't have a high level of credibility."